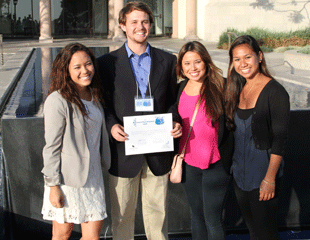 The University of San Diego Center for Peace and Commerce has recently awarded us the 2012 Southern California Entrepreneur for Social Change award! We were selected out of ten organizations including AidChild, Nika Water, Just Like My Child, and Pure Avida Bracelets. This is a tremendous honor to be mentioned alongside these great organizations, and it is also a testament to how much we have accomplished together! Finding Refuge could use your help on Facebook! A student has decided to feature Finding Refuge in a contest for Social Entrepreneur Project of the year through University of San Diego’s Center for Peace and Commerce. The winner will be recognized with a distinctive award honor, and this will help solidify the sustainability of Finding Refuge at the University of San Diego for years to come. If you could all take a few minutes to ‘like’ our video, it would sincerely help our chances in winning this reputable award (especially if you published it on your own wall!). Right now we’re in second place. Finding Refuge has a solid chance to win this and every vote counts – We need your help! Thank you to everyone that helps spread the word! It has been just a little over a year since we achieved our 501c3 status and as time rolls by, our little nonprofit seems to be growing and growing. We’ve been sprouting up chapters, connections with universities, working on our apparel and design, reworking our vision, editing our website, and just working hard to make this the best it can be. The past few months we have also chosen an awesome group of student to be our Executive Chairs and our Advisory Board. We truly couldn’t have a greater group of people. Full of passion for ending human trafficking, enthusiasm for our projects, and love for the kids at City of Refuge. Heading up our Executive Chairs include: Ariel Robinson, Bobby Schultz, McKenzie Lay, and Michael Penn. All of whom have shown sincere dedication to Finding Refuge and its future. Our Advisory Board includes: Jamie McClintock, Jill Ferguson, Lauren Brock, Lindsey Marconi, Marcus Williams, Rebecca Piland, Sammy Schreiner, Stephanie Kurica, and Yen Lin – who have all demonstrated drive and leadership. It’ll be great in the next few weeks to really see what we can accomplish with our new boards. Until next time – Cheers! After a two week hiatus due to the Thanksgiving Break, I’m back! And what a busy week it has been. Preparations in Eugene, Oregon’s are underway for the upcoming fundraiser that is tonight! We couldn’t be more excited for the event at the First Friday Art Walk. We’ll be located on 7th and Willamette in the Artist Alley with other artisans. They’ll be Ghanaian ethically produced products such as messenger bags and bracelets. There will also be some homemade ornaments, t-shirts, and rubber wristbands. This is such an important time for us. As most of us at Finding Refuge are getting ready to graduate college, we are hopeful about the future of our organization. With the vast number of fundraisers and informative meetings about our cause, we’ve been more than aware of the great following that we’re getting. And with that hope of the future, we must always remember our past and why we’re in the position we’re in. “One day a man was walking along the beach when he noticed a boy picking something up and gently throwing it into the ocean. Approaching the boy, he asked, ‘What are you doing’? After listening politely, the boy bent down, picked up another starfish,and threw it back into the surf. For me, that’s why we exist. To make a difference to one more child. Every human life is so important with a vast amount of opportunity laid out before them. The children living on Lake Volta are dehumanized to the point where they no longer believe this. We exist because we’d like to give every child the opportunity to succeed and make a difference. Whether they become pilots, business women, activists, or politicians, it doesn’t matter, the fact that they have been given the opportunity to succeed is enough for us. On that note, I challenge you to make a difference. Leave a legacy of helping others and creating a happier world for future generations. Here’s our second weekly Happy Friday post (still trying to think of a great creative name… I’ll let you know when it comes to me). This post comes from Ariel Robinson from Cornell University. She traveled on Semester at Sea in Fall 2010 and was instrumental in the creation of Finding Refuge. We love her a lot, and by the sound of it, she loves us too! Thanks Ariel! And watch out next week for another motivational Friday post. Have You Seen Us in the News?! As the newest member to the blogging world, I wanted to start out by making every Friday a meaningful Friday. A day of inspiration and with a side of motivation. We here at Finding Refuge are all about inspiring stories and positive messages so I thought that maybe I should produce a weekly little blurb about why we have such an amazing following of people. I just couldn’t think of a better way to begin the Finding Refuge blog! So, from the beginning: why am I apart of Finding Refuge? I think sometimes it’s hard to imagine a life without freedom and a life void of unconditional love without seeing it first hand. Even with a difficult upbringing, I was still supported to dream and to do what my heart desired. I was encouraged to go to college and travel. My possibilities were endless. The children of the Lake Volta region in Ghana work endless hours with little hope of rescue or opportunity; they aren’t shown unconditional love and their dreams go unsupported. They are faced with the reality that they may never see their family again and they are dehumanized to a point of living each day like a drone. Finding Refuge works to combat this hopelessness by organizing people on campuses across the country and supporting City of Refuge to rescue these children. I know its sounds cliche, but these children are the future. By giving them opportunity and breaking the cycle of poverty, we hope to change their future for the better. City of Refuge has already supported the futures of hundreds of children. Not only the children they’ve rescued, but by supporting single mothers with jobs, providing schooling in low income villages, and by saving orphans off the street and giving them a loving family. And that’s why I do what I do and why I’m so passionate about the children of City of Refuge. I was lucky enough to intern with them for a month and it was an amazing experience I’ll cherish forever. The children living at their orphanage have so much light in their eyes, like they could do anything in the world. And they CAN because they’ve been given the greatest gift. The gift of hope and opportunity to do what their hearts desires and to have a family that supports their dreams. Our last day in Ghana was spent on a service visit to the City of Hope Refuge, an orphanage and school about an hour north of Tema, in Doryumu, Ghana. The founders of City of Refuge Ministries, Johnbull and Stacy Omorefe, have taken on a significant and oft-ignored problem in Ghana: the selling of children into the fishing industry. Akosombo Dam at Lake Volta, the largest artificial body of water in the world, was built in 1966 and generates enough electricity for the entire country. A significant fishing industry exists in the Lake Volta region, and children are used by fishermen to dive underneath the water and retrieve the fishing nets. The problem of selling kids into the fishing industry is a difficult and multi-faceted cultural issue that they are approaching on several fronts. First, they seek out children to rescue from the fishing industry, where the kids are essentially on their own, often sleeping in boats at night. Second, they are trying to approach the cultural aspect through education of the masses, many of whom either do not believe or do not understand how the children have to live once sold. To the parents or grandparents, it is money they can use to feed their other children, while some believe that the kids are being given ‘opportunities’ to work. The reality is far more bleak, and often when presented with the facts of the children’s existence (via video, etc. ), they are upset and want their kids back. However, there is a significant portion of the population that refuses to acknowledge that there is a problem, and John and Stacy are thus trying to attach a cultural stigma to selling children as a way to prevent it from occurring in the future. Lastly, they try to perform follow-up with each rescued kid on a monthly or semi-monthly basis, continuing to provide things like school uniforms and books, attempting to prevent the kids from disappearing again. John and Stacy currently house dozens of orphans and single mothers. They are currently building a school, which will be officially dedicated tomorrow, and though it is not yet finished, classes are being held for both local kids and the orphans at the City of Hope. They also occasionally hold ‘feedings’ for populations that are in need. When we arrived at the orphanage, they were preparing 300+ meals that we would distribute later in the day. John and Stacy talked about what they did, and showed us a video of their interactions with local populations regarding the selling of kids into the fishing industry. Sad to think that, in effect, slavery continues to be part of this country’s cultural fabric, despite the fact that slavery was abolished in the early 1800’s. After asking some questions, we walked around the grounds, then boarded the bus to head approximately 1 mile to the school grounds, the land of which was granted to them by the local chief. The buildings were still under construction; concrete block, like so many structures in Ghana, with open windows/walls to the outside. Five or six classrooms were occupied by kids from kindergarten age up to about Year 6-7. We all walked around these grounds, then half the people headed back to continue preparing the food for the feeding, while we split up and went into each classroom to observe and help. Where was I? Oh yeah, once the book got all the way around the room, it was time for lunch, followed by recess. The kids all got a stew with some banku, and we then headed out to the concrete basketball court for some fun. Basketball, soccer, tag, and a hopscotch-like game the girls played called ‘umpu’ (if I recall correctly). One of the girls gave out some stickers, and kids seemed to latch onto a college student or two, following them around, getting them to play, etc. Reade and Tate had a blast, and after about an hour it was time to move on to the feeding, which was about a 30-minute drive back toward Tema. As the bus neared the port we turned to the east, and headed down some very bumpy dirt roads, past shack after shack, finally arriving at a real structure, where we parked. Inside were several women with sewing machines that had apparently been provided by the City of Refuge Ministries, and the women had learned to make shoulder bags from local cloths. We bought one, and then we headed out to distribute the food, which was packed both in the back seat of the bus and John’s Toyota Sequoia. The students formed a ‘bucket brigade’ to get the styrofoam containers from the back of the bus to the front, where the local kids would come out of the building’s outdoor walkway. They funneled them from front to back, trying to ensure that each kid got only one meal, as there could not be enough for all. Kids started showing up in droves, and were directed to the rear of the building to get in the queue. Tate, being the shy one that he is, was right at the head of the line handing a large predominance of the meals to the kids as they came out. And out they came! Dozens and dozens of kids, some kids with babies, a few young adults with kids; they just kept coming. Kids of all sizes and sorts, dressed in all kinds of things, much of it clearly donated (you cyclists out there take note of the image of the kid in a blue shirt, in the ‘Portraits of Ghana’ post that follows this one). Many of them smiled broadly after getting their meal, some just took it and ran. After about 30 minutes I walked around the back to see how they were coordinating all of this, and was astounded to still see dozens of kids in back, still waiting. I started smiling at the kids, engaging them, seeing if they were interested in the camera, which they were. As I started taking pictures of the ones that came over, more became interested in having their picture taken, every one of them wanting to see themselves on the LCD screen afterward. I just kept shooting and showing, shooting and showing. Whenever I would get a group of 2 or 3 together for an image, other kids would immediately run over and join in, kind of like rugby players jumping into a scrum. So fun to see the delight on their faces, seeing themselves on the screen, some of them running around to find a different friend to have a picture taken with. And they just kept coming. As I returned to the front of the building, I looked off to the side where some of the shacks were, and noticed one adult male sitting on the porch, polishing off one of the meals. We had seen only a handful of men helping with the feeding, and I hoped that this guy’s kid got some of that meal. Who knows how many brothers/sisters each of those meals was shared with? I did note that I didn’t see a single kid stop right there and start eating; they all either held onto their container and hung out for awhile, or immediately disappeared into the innumerable rows of shacks, which apparently are rented out for 7-8 cidis a month, in many cases to single mothers, a chronic issue here in Ghana. 30 minutes later it was time to head back to the ship, and as we boarded the bus, there were still dozens upon dozens of kids still waiting to be admitted to the back of the building, waiting to get their meal. As we drove out, many kids waved at us all along the dirt road, and we got to look again–with different eyes–at the homes of the kids we’d just interacted with. We got back to the MV Explorer well before today’s on-ship time of 1800 hrs, and were again met by our cab driver Eric. We walked around the vendors’ tents, chatting with Eric, looking to spend our last few cidis before departing later that night. Reade got a nice African-print collared shirt for 15 cidis, while Tate got a mini-drum for 7.50 cidis. We decided it was time for a shower, and bid farewell to Eric and the soil of Ghana, stepping onto the gangway, returning ‘home’ after our fourth day here. Later that night after the ship left the Port of Tema, we immediately crossed the meridian into the eastern hemisphere, the gateway to the bulk of our travel destinations for the next 6 weeks. Finding Refuge has taken off in 2011 with the philanthropy growing to 7 University and College Finding Refuge Clubs. We are constantly looking for members to join multiple Finding Refuge committees and establish clubs at your respective Universities. For more information please contact us at volunteer@findingrefuge.com. See how you can get involved this semester and make a difference. McKenzie Lay, Jamie McClintock, Ben Leopold, and Annie Mosely presented Finding Refuge at the University of Oregon’s International Projects Fair. To a panel of judges, they presented their stories of traveling to City of Refuge and the experience of creating Finding Refuge. They presentation won first place and secured a $100 prize in which they donated to City of Refuge. Aerial Robinson led the personal fundraising campaign at home and was able to get $1000 from Marks Pizzeria as a general donation to Finding Refuge. Rebecca Pilard and Thomas Shelton organized the speaker series during Derby Days at Steven F. Austin College inviting students to help humanity through proactively combating child slavery in Ghana. Finding Refuge began the process of establishing an On-Campus organization at the University of Texas and continues laying the ground work there. Finding Refuge volunteers completed two successful trips to Doryumu completing two feeds at Lake Volta. The Finding Refuge team raised enough money to donate a full size basketball court to the children’s village at City of Refuge which was painted during the first summer trip. A large financial contribution by the Edwards family enabled the donation. McKenzie Lay and Jamie McClintock did an interview in Eugene Magazine where Finding Refuge of featured (article soon to be scanned and uploaded). After the initial founding of Finding Refuge, many of the volunteers have been meeting to help create organizational structure for the philanthropy to carry on and grow. An internship position was established at City of Refuge with a student from SAS f10. In the Spring 2010 voyage, Stephanie Kurica arrived in Tema, Ghana with Semester at Sea and, by coincidence, met Stacey Omorefe on the street.. In their brief conversation, Stacey told Stephanie about City of Refuge, a home she and her husband,John, had started to rescue children from child slavery situations in Ghana. Stephanie learned that child slavery is one of the fastest growing problems Ghana faces with thousands of children taken from their families each year.In Tema, poor mothers are targeted by slave traders, who promise an education for the children or offer the mothers money—a pittance by U.S.standards, but enough money to pay for food for several months in Ghana. The mothers hand over their children, hoping they will have a better future. Instead, they work as many as 14 hours a day doing hard labor on fishing boats and in fisheries.In the past 18 months, since City of Refuge opened, the Omorefes have rescued over 40 children from child slavery, mainly working on fishing boats and in fisheries. Stephanie Kurica was inspired by the talk and returned the next day with friends from Semester at Sea (SAS) to help paint the facility. make to City of Refuge, to bring supplies, clothes and a donation to feed children in the home and the village. He gave the same talk to the 60-plus lifelong learners. Within days, Ken and Marty had amassed a group of volunteers that shocked them — more than 30 students and lifelong learners wanted to join them on a five-hour drive from port of Takoradi to Tema to help. Even more lifelong learners donated money to extend a feeding program the Kuricas were organizing, so that they could feed 1,200 children from the immediate village and a surrounding village. The project was then in full motion. Ken and Marty got a bus to take all of the volunteers to Tema. They contacted the home to alert them about the number of volunteers and make sure everyone had a role to play. (Stacey Omorefe quickly replied with an organized itinerary of activities and duties.) They held several planning meetings to review the constantly changing logistics.In the end, the group left at 3 a.m. on the MV Explorer’s second day in Ghana to arrive at City of Refuge for a service project that has changed their lives. In the weeks and months that have followed the group’s visit to City of Refuge, the students have not stopped working to tell the organization’s story and find a way to help. said Ariel Robinson who attends Cornell University and has been completely dedicated to the project since the trip in Ghana. With the help of the Kuricas, the students started a 501c3 nonprofit called Finding Refuge to help the orphanage and, over time, abolish childhood slavery. And they have mobilized a floating campus aboard the MV Explorer, educating their fellow voyagers about the extent of child slavery in Ghana, child workers in India and child prostitution in parts of Asia. With T-shirts asking “What are you Ghana do?” and a website created, these impassioned students have raised $13,000 to date and have enlisted 30 more classmates, lifelong learners, faculty and staff who were moved by their stories.“I didn’t have the opportunity to go to the orphanage, but you can help but be moved by all that they’ve seen and what they’ve done,” said Marcus Williams from the University of Rochester. “It cost only $1,000 to save a child from slavery.